Radical reactions require an initial first step to get going. We call this reagent the radical initiator. Concept #1: Heterolytic vs. Homolytic Bond Cleavage . Starting from the very beginning, radicals are these very high-energy intermediates that in the natural world exist for only very short periods of time. If you ever hear about free radicals in nature or in your body, these are things that last for tiny amounts of time and they're gone. They terminate. When we're dealing with reactions with radicals, the first thing we need to ask is how do we even get these radicals in the first place. That brings us to radical initiators. Every radical reaction that we talk about is always going to start off with a radical initiator. First of all, let's just talk about how radicals break off differently than regular single bonds. Basically, it turns out that single bonds can be broken in two different ways. They can be broken heterolytically or homolytically. Let me show you the difference between that. A normal heterolytic cleavage, that means that I'm breaking this bond and I'm going to get different charges on both sides, would mean that two electrons, both of the electrons from that bond, are moving to one atom. That means that one atom is going to have a negative charge and one's going to have a positive. Let's look at this example bond right here. I have a carbon and some kind of halogen. How could we predict which of the species would get the negative charge or would get the lone pair on it? Do you guys know how to predict that? The way that we would predict is that we would say the one that's the most electronegative is the one that gets the electrons when the bond breaks. So there's actually a pretty powerful dipole going towards the X depending on which halogen we're using. What we would say is that, if we were to break this bond, the way we would break it is towards the X. Notice that I'm using a full arrow and that's showing that both electrons kind of pick up, pack their bags, and move to the X. What I wind up getting is ions. I wind up getting a C+ and an X-. This is, like I said, this would be heterolytic cleavage. Now the reason that we call it heterolytic is because hetero stands for the word different. You're getting different amounts of electrons on both. Now notice what this creates is ions. Your products are different ions, a cation and an anion. That's one way to would break bonds. But another way to break them is that I could break them just taking one electron from each side. So I could take one electron and give it to that X. I could take another electron, give it to that X. Notice that one thing that was different about this bond than the other one was that there was really no dipole. I couldn't tell which one was more electronegative or not because they both had the same electronegativity. That's actually going to be important. What that's going to do is it's going to give me instead of a negative and a positive, that's going to give me two of the same thing, hence the homolytic cleavage. In this case, homo meaning same. That you're getting basically the same electrons on both. Notice that our product here would be radicals. Cool so far? Awesome. Basically, I want to show you guys the difference between the arrows that I just drew. When we want to draw that two electrons are moving to an atom, we say that full curved arrows are used to indicate the movement of two electrons. That means it's a full-headed arrow. It has both sides of that arrowhead. When we want to only show that one electron is moving, we would use a half-headed arrow or what is sometimes called a fish-hook arrow because it's only got half of the arrowhead on it, like I use on the X's. It turns out that homolytic dissociation is usually much higher, dissociation energy, is typically higher than corresponding heterolytic dissociation energies. What that means is that most of the time when we're breaking bonds in organic chemistry, we're actually going to be using the blue method, the one that's heterolytic. And you're going got see that whether you get into other types of reaction or just later on the course, you're going to see that we're going to use a lot of heterolytic cleavage. 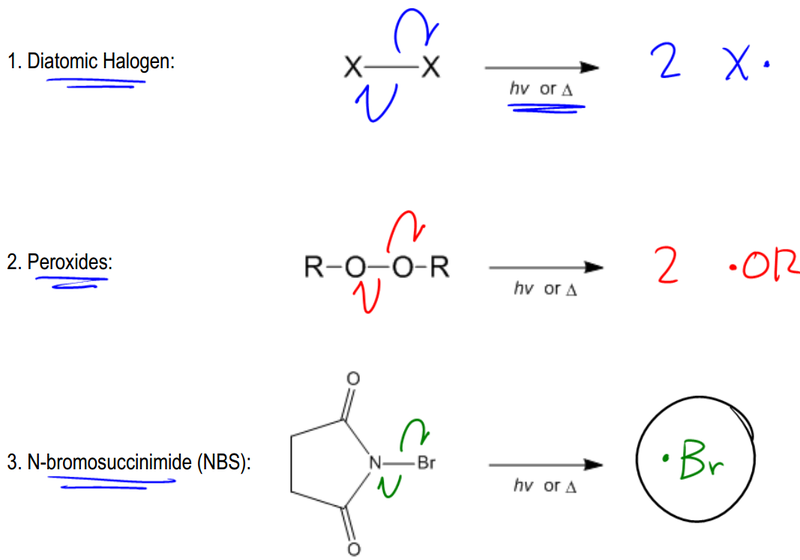 Homolytic cleavage is really reserved just for radical reactions. These are reactions that are favorable for just a small set of reasons. It only starts off with initiator. Chemical bonds can be cleaved in two ways: Heterolytically (ionic cleavage) and homolytically (radical cleavage). Homolytic dissociation energy is much higher than a corresponding heterolytic dissociation energy. Concept #2: What are Radical Initiators? So, let's go ahead and see how this works basically it turns out that not that many like I said it takes a lot of energy to break the bond so that only one electron goes to each, Ok? So what that means is that in order to get a radical initiator we should actually start off with molecules that have relatively weak bonds, OK? If they have relatively weak bonds it will be easier to split them off homolytically, OK? If it's a very very strong bond forget it that's going to be difficult to start off with making a radical, OK? So it turns out that there's three really common reagents that have weak bonds that are able to easily make these radicals, OK? And what that is diatomic halogen, OK? peroxides and something called NBS and we're going to start off with the easiest one then we'll work our way down, OK? So diatomic halogen this is actually depending on which halogen you use that's actually one of the weaker bonds in organic chemistry, OK? And what that means is that in the presence of heat or light, OK? You need heater light why because like I said it takes a lot of energy to break these bonds so that one electron goes to each atom so you need some kind of energy source to make this happen, OK? So we usually use like ultraviolet light or heat and what that's going to do is it's going to excite the electrons in that bond and enable them to jump homolytically on to each atom, OK? So in the presence of heat or light what we're going to wind up getting is 2 X radicals, OK? That's called a radical initiator because now I have my first radical that I can use for the mechanism, we don't know the mechanism yet but at least you know this is how you can get a radical, cool right? By the way, the arrows will just look like the ones that I drew, one electron from the two electrons in the bond one electron jumps to each X, OK? The same thing can be said of peroxides, peroxides also have a relatively weak bond that O-O bond relatively weak and peroxides are going to be able to once again break off homolytically and in this case, it would make 2OR radical initiators, OK? So once again I'm using a relatively weak bond in the presence of heat or light and that's going to dissociate homolytically and what I wind up getting is radicals, OK? Lastly we have something called NBS, now you guys aren't really going to understand why this is called an N-Bromosuccinimide until Orgo 2, in Orgo 2 we actually will understand why or how to name that but for right now all I want you guys to be able to do is recognize the full name, recognize the short name which is the acronym NBS which is the way that most professors refer to it but you should also recognize the structure just in case your professor wants to pull a fast one on you and test your knowledge, OK? And it turns out that NBS has again a pretty weak bond between that nitrogen and that bromine so it turns out that NBS is actually a source of bromine radicals and in the presence of heat or light you'd get one electron moving to each, the part that we care about is that you're going to get 1BR radical, OK? In fact we're not even going to draw the other side because the other side is not really involved in reactions all I care about is that I'm getting this 1BR radical that can then react with other things, alright? So I hope that you guys are understanding from the very beginning we always need an itinerary, we need something that's going to that's going to make this improbable type of cleavage happen and that's through these weak bonded elements like this, OK? And now that we understand this we can move on through the mechanism so let's keep going let me know if you have any questions. Radical initiators have relatively weak bonds that can be more easily cleaved by hemolysis. DRAW the structures of the transition states (geometry unnecessary) for the two propagation steps (in either order) in the chlorination of chloromethane to dichloromethane, with dotted lines to represent partial bonds. You may omit δ·. Use single-barbed curved arrows to show a homolytic bond cleavage of ethane to produce two methyl radicals. Draw the major monobromination product when the following alkane is subjected to radical bromination at 25°C. If there is more than one product, both may be drawn in the same box.